Jonathan Holloway, provost of Northwestern University, delivered the Fall Diversity and Inclusion Lyceum Lecture. “From my position as provost, I am going to do all that I can to make things better in the present and in the near future. 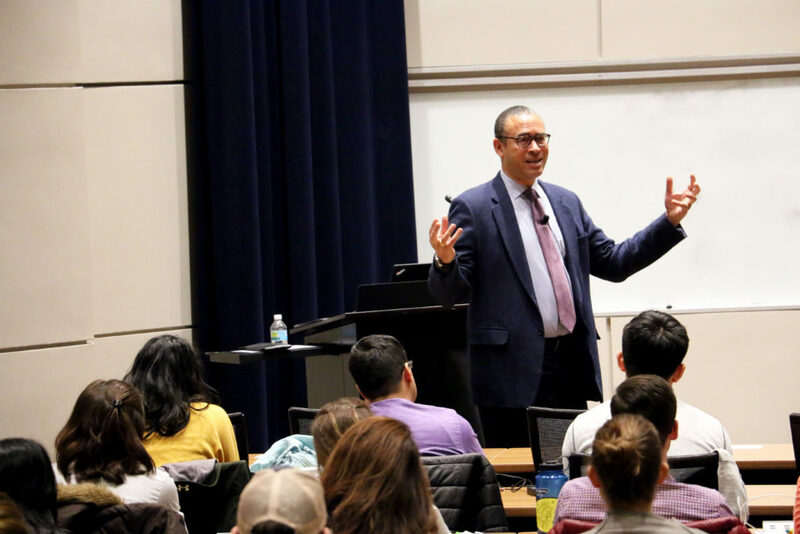 But the real promise is to be found in the next generation,” said Jonathan Holloway, PhD, provost of Northwestern University, opening the Fall Diversity and Inclusion Lyceum Lecture. The event, held November 29, was sponsored by the Office of Diversity and Inclusion and attended by Feinberg medical students, faculty and staff. Holloway, a historian specializing in post-emancipation United States history, provided a historical overview of African-Americans in majority white universities during his address, “The Price of Recognition: Race and the Making of the Modern University.” But he also spoke personally of progress and his optimism for the future. “I look to all of you, the medical students especially, with the hope that you will find ways to break with old institutionalized habits that represent acts of bad faith, that you will learn to be a constructive critic — not merely a critic — that you will be a champion for the most humane practices in your respective fields, and that in the process of caring for your patients you will also be committed to learning what you can about them — their traditions, their cultures — that you will, to put it another way: see them,” Holloway said. The Lyceum Lecture series was launched in the fall of 2015, and has featured a variety of luminaries since, including Antonia Novello, MD, the first Hispanic and first woman Surgeon General, and Neil Powe, MD, MPH, MBA, chief of Medicine at San Francisco General Hospital and a leading investigator in healthcare disparities. Mae Jemison, MD, the first woman of color to travel into space, delivered the Martin Luther King, Jr. keynote address. 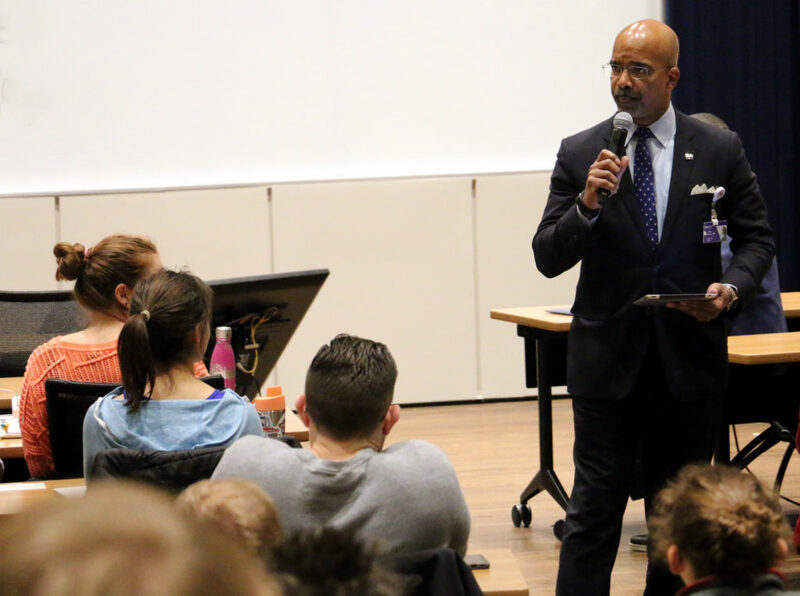 Clyde Yancy, MD, MSc, vice dean for Diversity and Inclusion, introduced Holloway to an audience of medical students, faculty and staff. Holloway, who joined Northwestern as provost on July 1, 2017, was formerly Dean of Yale College and chair of the Department of African-American Studies. He joined the Yale faculty in 1999, after earning three advanced degrees in history from the university. Before delivering his lecture, Holloway also shared a personal anecdote, from when he was a college student interning in Washington, D.C.
During the event, Holloway also acknowledged the presence of the Northwestern Medicine Scholars in the audience. The pipeline program encourages outstanding high-school students from underrepresented populations to explore careers as physicians or biomedical scientists. Afterwards, Feinberg medical students joined Holloway, Yancy, Eric G. Neilson, MD, vice president for Medical Affairs and Lewis Landsberg Dean, and Teresa Mastin, PhD, director of Diversity and Inclusion, for a lunch to further the conversation.